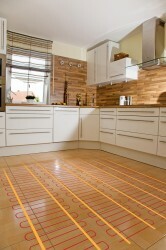 Electric underfloor heating systems have become a popular choice for use in bathrooms, kitchens and conservatories. When we talk about electric underfloor heating or radiant floor heating as it is called in the US, people wonder what types of floors you need to use this heating system with. The answer to this is, it is compatible and can be used with most common modern flooring types. But naturally, some floor types are more suitable than others. Floor types such as natural stones and ceramic floor tiles which are very good conductors or transmitters of heat and don’t expand or contract very much are the most suitable flooring for underfloor heating systems. As a result electric underfloor heating systems have become a popular choice for use in bathrooms, kitchens and conservatories because people use hard surfaces like these more often in these rooms. In the United Kingdom, carpeted floors are the most popular type of flooring today. The good news is you can use underfloor heating with them too, if the carpets you use are not very thick. In order to use electric underfloor heating systems with carpets the carpet’s TOG value should be less than 2.0. If there is a underlay carpet, the combined value must be less than TOG 2.0. Unfortunately electric floor heating does not fare well with wooden surfaces though it can be used with some wooden floor types. Two popular flooring used very often in United Kingdom such as beech wood and maple wood floors are not recommended for installing underfloor heating. However, there are other wood and timber types and even laminated floors you can use underfloor electric heating. You need to check with your wooden floor supplier as well as heating system supplier to make sure they are compatible before you select either. The same is true with Marmoleum, Linoleum, PVCs and cushion flooring. This heating system can be used with them but you will need to check with the suppliers.